Prime Minister Justin Trudeau told delegates at the Paris climate change summit that Canada "will take on a new leadership role internationally." He made the comment in his opening address to the UN summit as two weeks of meetings are set to begin. "Canada is back, my friends," Trudeau declared. "We're here to help." Prime Minister Justin Trudeau told delegates at the Paris climate change summit today that Canada "will take on a new leadership role internationally." He made the comment in his opening address to the UN's 21st Conference of the Parties (COP21) summit as two weeks of meetings are set to begin. "Canada is back, my friends," Trudeau declared. "We're here to help." 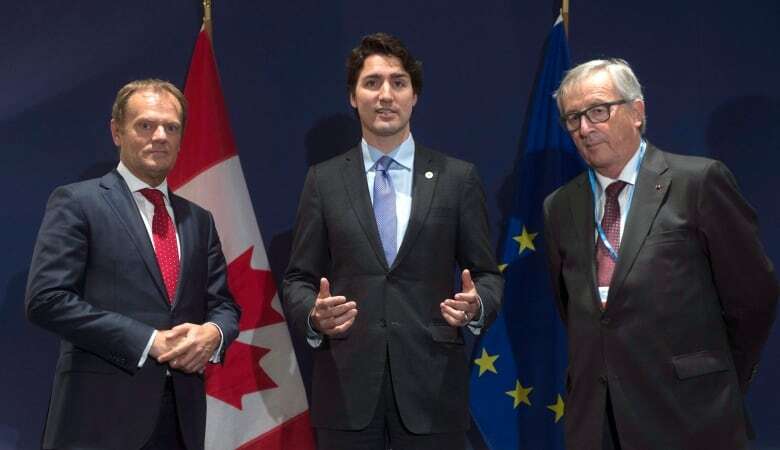 Trudeau credited the provincial and territorial leaders accompanying him in Paris for having already taken on a leadership role on climate change in this country. "From cap and trade, to a ban on coal-fired electricity generation," he said, citing actions already taken by many provinces. "From world-leading innovation on carbon capture and storage to a revenue-neutral carbon tax, we can learn and build on these models." Saskatchewan Premier Brad Wall said much of the developing world is not only reliant on coal-powered electricity, but is building more of these types of plants as their countries grow. "There are a thousand coal plants being built around the world — they are going to be burning a lot of coal," Wall explained to reporters in Paris, where he is attending the summit with Trudeau. "Canada can be a leader in cleaning that coal up because we are a leader in carbon capture and sequestration technology." B.C. Premier Christie Clark also believes there are economic opportunities for her province in exporting its ideas and technology around the world. After his address at the COP21 summit, Trudeau also spoke at an event hosted by the World Bank about carbon pricing. The prime minister called carbon pricing — be it through a carbon tax or a cap-and-trade system — "a crucial tool to begin the shift we need towards sustainable economic growth." "This is a pro-growth policy," he added, "It's the key signal that we can send to the market and to our citizens that we're committed to the development of a low-carbon economy, and all the benefits that entails for our environment, our health, our security, and for global growth." Earlier Monday, Trudeau reiterated some of Canada's emission targets, but how they will be achieved hasn't yet been nailed down. "We know that we have work to do, which is why we started the work of getting together even before coming to Paris — all premiers and I made serious commitments about taking the kind of action Canadians expect," he told delegates at the summit. 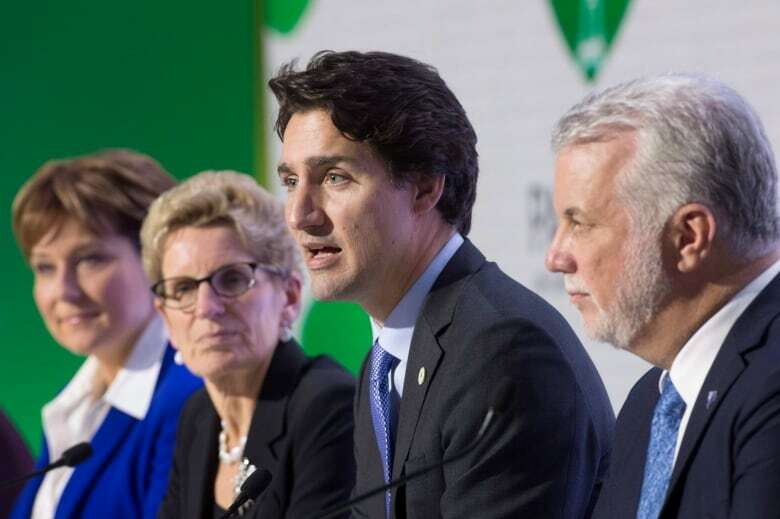 Trudeau met with the provincial and territorial leaders last week in the opening volley of what he promises will be an ongoing dialogue on the climate. So far, each province has been allowed to go its own way in tackling the issue. With Alberta's announcement last week that it will introduce a carbon tax, Trudeau noted that "86 per cent of the Canadian economy is now covered, or soon to be covered, by a price on carbon." Trudeau has further promised to host another meeting of first ministers, within 90 days of the wrapup of COP21. It's at that meeting the "how" of achieving Canada's emissions targets is expected to be firmed up. The new Liberal government has resisted efforts by climate change groups and the media to lay out its targets and timelines for achieving them. NDP Leader Tom Mulcair also called for a plan to meet those targets during a press conference in Paris Monday. Environment Minister Catherine McKenna noted ahead of the Paris talks that her government had only been sworn in a few weeks ago and, "I don't think anyone thinks it would be helpful that we throw a number on the table and then not have the ability to deliver on that."